In this episode number 9 of the InnovaBuzz podcast, Alan Barton from Lehigh Technologies, shares with us the fascinating story of the growth of that company and how it is turning old car tyres into useful products. Listen to the inteview to learn what Alan shared with us on the podcast. Today I’m going to give away a copy of Cradle to Cradle by William McDonough and Michael Braungart. Leave a comment under the video and tell us about your favourite recycling innovation and how that is contributing to this Cradle to Cradle approach. I’ll get Alan to swing by in a few weeks and award the prize. Roughly one tyre per person per year is discarded – either burnt or sent to landfill. That’s a huge resource, some of which Lehigh is turning into an innovative product that provides improved performance and cost savings in a number of applications. Lehigh take waste, end of life rubber, turn it into a micron scale powder that can be used in a wide variety of different specialty chemical end uses in our everyday life – materials that we see all around us every day. Lehigh have developed a proprietary milling system for these waste rubber products, that produces industrial scale quantities of micronized rubber powder that are then “recycled” into other products. Lehigh have expansion plans for new production facilities in Europe and Asia as demand for their materials grows rapidly. Alan talks a bit about the challenges of a “lean startup” model, the need to have the right people in place, at the right time. Here are Alan’s answers to the questions of our Innovation round. Watch the interview to get the full scoop. #1 thing to be innovative – Embrace risk and be prepared to make mistakes. Learn from the mistakes. Best thing for new ideas – Listen to others, as many people as you can, ask a billion questions, try to join the dots and see what it’s telling you. Favourite tool for innovation – Approach each situation on a case by case basis, no tool really. Keep project / client on track – Get yourself in front of the customer often, clear communication and show that you care. Differentiate – Be a technology leader, develop that position and protect it. You can reach out and thank Alan via Lehigh Technologies’ Website or their Facebook Page. Alan suggested I interview Professor Maree Smith of Queensland University, on a future podcast. So, Maree, keep an eye on your Inbox for an invitation from me, for the Innovabuzz Podcast! Hint: to enter the competition, leave a comment under this video and tell us about a recycled innovation that you’re aware of that perhaps you’re doing yourself or you’ve seen other people doing and how that is contributing to this Cradle to Cradle approach. Hi, I’m Jürgen Strauss from Innovabiz. Welcome to Episode No 9 of the InnovaBuzz Podcast – designed to help smart businesses with an interest in innovation and the Internet of Things become even more innovative. In this episode, our guest is Alan Barton, from Lehigh Technologies, based near Atlanta in Georgia, USA. I’m really excited to have Alan on the podcast – Alan and I worked together when we were both at Rohm and Haas and I was fascinated to learn about what he has been up to since he joined Lehigh Technologies, who take old, scrap rubber and turn in, not only into something useful, but something that improves the performance of the products where it ends up in and also reduces costs. There are a lot of fabulous lessons to be learnt on innovation and on managing a startup company that is building upon a technology platform which differentiates it from competitors. Alan talks about the need for building a team with the right expertise, managing expansion in concert with sales and the idea of taking calculated risks in order to be innovative. It’s another fascinating interview with many great insights. This week’s innovation tip is welcome failure! That’s right – in fact, there really is no such thing as failure, or a mistake. The things we normally label as such is just feedback, feedback along the road to success and a new innovation. To be truly innovative, we must develop in our organisations, the freedom to experiment, the freedom to gather that feedback, indeed the freedom to succeed. That means the freedom to “fail” as well. Of course, don’t just take reckless risks or repeat mistakes of the past or of others! Do your homework first, be strategic, but then don’t be afraid to take some risks. Focus less on what you have to lose, and more on what you have to gain. Before we meet Alan, a quick competition announcement – this week’s competition prize is sponsored by Innovabiz – where we help smart, innovative business owners who need REAL, tangible results from the internet, transform their online presence into a business generation machine, that works EVEN when they are not working. The prize is a copy of Cradle to Cradle by William McDonough and Michael Braungart. Stick around for details on how you can enter the draw to win that competition prize later on in the interview. 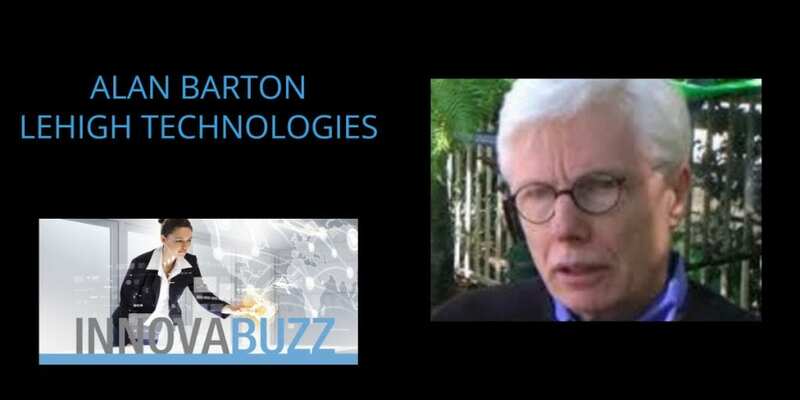 So stay with us, let’s get into the Innovation Hive and get the Buzz from Alan Barton. Jürgen: Hi I’m Jürgen Strauss from an Innovabiz and I’m very pleased to have here with me all the way from Philadelphia in the U.S.A. Alan Barton. Alan is the Chief Executive Officer of Lehigh Technologies. Welcome Alan to the an InnovaBuzz Podcast. Jürgen: Lehigh Technologies take recycled rubber and basically make micronized rubber powder from that and that micronized rubber powder is then used in a variety of applications that deliver savings in both energy and production cost and also reduce waste and improve performance but we’ll hear more about that from Alan later on. Alan also serves on the board of a number of companies including Renmatix, Technitrol and Wilbur Ellis Company. I’m really looking forward to Alan sharing his insights with us today because he does have an enormous variety of experience and of course I know Alan from having worked with him in the days when I was with Rohm and Haas. Before we learn more about Alan and about Lehigh, a quick competition announcement – today I’m going to give away a copy of Cradle to Cradle by William McDonough and Michael Braungart. That book explains how products can be designed from the outset so that after they are at the end of their use-life, they will provide nourishment for something new; continually circulating as pure and viable materials with a Cradle to Cradle model. Stick around for details on how you can enter the draw to win that later on in the interview. Alan, before we learn about Lehigh Technologies and the innovative stuff you’re doing there, let’s find out a little bit about you. Taking you back to when you were a young child, what did you want to be when you grew up? Alan: Yeah, about a 1000 years ago something like that! When I was a really little kid I was crazy about planes. All I wanted to do is be a pilot. Then by the time I got into high school, that’s when reality set in I think and my goal was to be a Nuclear Physicist at that point. Needless to say neither of those two career choices actually happened. Jürgen: When did you … Yeah, it’s funny I was listening to some podcasts yesterday – two different guests who said they wanted to be pilots when they were young so it seems to be a common dream of young children. When did you change direction and go into chemistry? Alan: In high school I was fascinated by both Physics and Chemistry and the fact that my Math probably wasn’t up to snuff to the extent that it needed to be, pointed me in that direction and I must say I haven’t regretted it since. Jürgen: You had a really great academic career early on – you went to Oxford if I remember correctly and then to Harvard to do your PhD. From there did you go straight to Rohm and Haas from there? Alan: I did, yeah once I, once I left with my PhD from Harvard, I was looking to stay in the U.S. and go into the field of synthetic organic chemistry and Rohm and Haas was great enough to offer me a job and so I moved down from Boston to Philly and started my career there. Jürgen: You’ve being in Philadelphia ever since? Alan: With six years out in Germany with Rohm and Haas in between where my kids were born; Yes basically been in the Philly area for all that time. Jürgen: I think it was while you were in Germany that we first met. Alan: It was yup. It was. Jürgen: Tell us a little bit about Lehigh Technologies now. Alan: As you mentioned the company was founded on the idea that there had to be something better to do with old tyres or old rubber waste than just burning them, shredding them and burning them or burying them and so on and so forth. The founders of the company believed that if you could turn that end of life material into micron scale powders, that that would open up a bunch of different opportunities that will be higher value than those typical, alternate recycling type markets. They founded the company in the early 2000s, so I think around 2003 with that notion and they spent a few years researching the types of technology that you would need to be able to turn those chunks of rubber into those very, very fine powders. They settled on a particular type of technology out of Germany; acquired the company and started to build a manufacturing plant. I joined in 2008 after they had raised a significant amount of money from well-known investors like Klein and Perkins and so on to move the company to next stage which is how do you then really commercialize those materials into the type of specialty chemicals in use markets that we are in today. That’s how I got involved and that’s where the company started. Really we’ve been commercial, the plant started manufacturing materials to scale in 2007 and those who … That was when the first sales were, and then since 2008 we’ve really seen tremendous growth even though that’s been during some of the tougher economic times around the world, we’ve been successful at growing between 30 and 40% every year since then. Jürgen: That’s pretty amazing. I was reading some statistics about the use of rubber tyres and where they end up and it’s pretty staggering. I think these might be actually under-stated because they are from back in 2008 or so we are talking about 240 million tyres in the U.S.A alone that were thrown away and fewer than 7% being recycled. There’s a huge opportunity there to actually do something with all that material, isn’t it? Alan: Exactly. You can use almost the guide for western democracy, some industrialized economies – one tyre per person per year is thrown away. That works for Japan, it works for the European Union, it works for the U.S. These days about half of those discarded tyres are burned for their fuel value. Right so better than burying them or leaving them lying around on the edge of town, but hardly a beneficial use. Hardly something to be proud of given all of the technology in the chemistry that has been put into that material in the first place. Alan: It’s a huge opportunity just like you said. Jürgen: You’ve got a production facility in or near Georgia in Atlanta, right? Jürgen: Sorry, Georgia near Atlanta. Tell us a little bit about that and the technology because I believe that’s the biggest of its type in the world. Alan: It is. As I mentioned earlier that the milling system is a proprietary system. It’s covered by a bunch of patents. In fact Lehigh earlier on bought out the small German manufacturer that produce those materials, so we’re really the only ones that have this technology and fundamentally the process is cool the rubber in feed down with liquid nitrogen so that it’s way, way below its Tg. Then you have something brittle that can be pulverized. The type of mill this is, is an impact mill, so imagine that frozen piece of glass like rubber being introduced to a jet turbine. You have large wings whizzing round at 2500 RPM into that comes cryogenically frozen rubber with a bunch of liquid nitrogen with it. It impacts the veins immediately shatters into a complete particle size distribution and within milliseconds the expanding gas is blowing it out the other end of the system. It’s then warmed up carefully so that you can separate it out in different particle size distribution components and then packaged in various systems after that. The thing that’s unique about the system, first of all because it is cryogenic, it’s very gentle on the polymers because if you want to use that chemistry again you don’t want to basically destroy it first. It’s very gentle on the polymers. The scale of it is such that we can produce thousands of pounds an hour. It can produce industrial scale quantities. Which is what you need to do if you’re going to be servicing construction industries or the tyre industry. The particle size distribution is skewed to the very, very small. One of the keys to be used in those applications is the amount of service area that you have. Therefore this type of system is well, well designed for what we’re trying to do. We have six production lines, the capacity is over, it’s right around 70,000 tons per year. We are not using that much of course at this point but growing at the rate we are, you can see that we’ll be bumping up against that in the not too distant future. Jürgen: Tell us about some of the end user applications that the product then finds its way into. Alan: Tyres is our largest market. You can imagine the notion of putting this material back into tyres as perfectly logical. It’s taken us a long time to figure out how to use it in tyres, in other words how to optimize those compounds, those formulations to get exactly the right performance. For somebody with your background just think of how one has to optimize the use of opaque polymer in paints yeah? Alan: Same notion, same question. That’s our largest market and to give you a sense of how broadly we’ve been able to introduce it, over 250 million tyres have been manufactured using our products since we started really producing at scale in 2007, and early 2008. Tyres is our largest market, industrial rubber is another obvious one. Asphalt modification is another significant market for us. Some material like that is used in Australia and a couple of other Asian countries where the rubber is put in there not only to reduce cost but to improve some of the performance properties. High temperature rutting, cold temperature cracking, things like that. That’s an important use for us. Construction applications, sealers for parking lots, water-proofing systems for the building envelope, cladding for roofs to help improve water resistance and things like that, are just some examples of markets that we are currently commercial in. Jürgen: That’s a pretty wide gamut there of applications and I’m sure you’re discovering new ones all the time as well. Alan: That’s the plan. That’s the plan. Jürgen: I noticed you’ve recently… I don’t know recently probably a few years ago set up an applications development center as well to … I guess that one of their roles would be to optimize those formulations as you mentioned. Alan: Exactly. We are unique in this market in that we have basically adopted the positioning as a specialty chemical supplier. We are effectively producing an additive that could be used in a wide range of systems with a set of performance attributes, it just so happens that the raw material for it is an end of use material, but other than that we look, sound, smell and feel like a specialty chemical company. Alan: You mean for the company? Alan: We basically take waste, end of life rubber, turn it into a micron scale powder that can be used in a wide variety of different specialty chemical end uses in your everyday life. Materials that you see all around you every day. Jürgen: Yeah. Yeah that’s … I like that, that’s understandable to everybody. Jürgen: Really good. You mentioned a little bit about the innovation in production that you use and I’ve heard you describe that on a video I think, as a jet engine with teeth and you talked a little bit about how that worked. Tell more about that, because the other thing I noticed was, or I read about, was this closed loop business model that I think was talked about on your website. Tell us a little bit more about that. Alan: In fact the guys that wrote the book that you’re going to give away are very fond of the whole closed loop model for maximum, not only resource efficiency but sustainability as well. Several parts of the rubber world produce significant amounts of process scrap. As an example when a re-tread tyre is manufactured it’s made in a very large band of tread stock. There’s quite a lot of process scrap that comes with that. In the past that material was simply sent to landfill. Here you have very high cost, high performance rubber being basically discarded. Over the past years we’ve worked with these companies to take that process scrap, we do the primary shredding and then we turn it into micronized rubber and we’ve worked with them to optimize those re-tread formulations to be able to use it back in their own system. For those guys now, think of it in terms of a quality assurance point of view, they’ve got exactly the same chemical compound that they started with, we segregate all that material so they only get their powder back. It’s a particle size distribution that’s optimized for their formulation and only for their formulation, and there’s zero waste and they save money. What’s not to like about that? Jürgen: Yeah. It’s a win, win, win. Alan: It hits all the buttons and we therefore have very tight relationships with those guys and so from a competitive advantage point of view, it’s a very sticky value proposition as well. Jürgen: Yeah. That’s really exciting stuff. Like you say it gives you the ability to partner very closely with your customers. Jürgen: Yeah, and add huge value. There’s gold in that in terms of a model to work with. Alan: Exactly, yup. We are trying to expand that now into some other rubber chemistry’s. Like butyl rubber which is very high cost rubber that is used for inner liners and things like that in tyres and also for EPDM which of course is used a lot in automotive for water-proofing and sealing as well. Jürgen: I noticed also you’ve just recently secured some funding to expand in … I believe you’re looking to expand production in Europe? Alan: Yes. In fact, we just completed our latest raise in the middle of the summer with our existing investors coming in with money as well as JSR Corporation a well known supplier of SBRs (ed: styrene-butadiene rubbers) based in Japan, who joined as a strategic investor in that round as well, which is excellent to have that sort of validation from a leader in SBR Technology supporting what we are doing. Yes, so those funds will be used primarily for geographic expansion. We are in the process of putting together a joint venture in Europe which will lead to local manufacturing early next year, and that will be our first production line outside of the U.S. Coming after that at some point will be a production line in Asia. We are already exporting quite a bit of the materials to Asia every month. At some point it makes sense to have a local manufacturing site, and we are currently looking at where that might be and what sort of size and scale and cost profile it could have. Jürgen: That’s exciting stuff. What do you spend most of your time doing on a day-to-day basis? Alan: Great question. Probably about a third of my time is focused on sales type activities. Our sales force is very small. There’s only five people on that including me. I’m spending a fair amount of my time with customers. I am the Chief Sales guy for Europe so I’m travelling over there pretty frequently with our JV partner. About a third on commercial activities, about a third on manufacturing, so think of that as cost reduction, productivity, capacity planning, all the stuff that goes with that because obviously as we scale, a lot of this equipment is being pushed to limits that it wasn’t intended for maybe at the beginning or designed for, so that we’ve got a lot of work to do on debottle-necking. And about a third of my activities are on what you would call, ‘internal’ so board of directors stuff, investor stuff, outreach with investment bankers, things like that and so on. Roughly a third, a third, a third and that adds up to about eight days in a week! Jürgen: I think that’s the case for most people running a business! Do you worry about anything? Is there something that keeps you awake at night? Alan: Lots of things. In fact if anything in the start-up world there’s even more things to worry about than there are in a more established company, because you’re so thin, you don’t have a lot of resources, so you don’t have a lot of people to do all that worrying for you. The things that keep me up at night, any manufacturing facility especially one that is chemically oriented – safety is a very important part of that we do and as this process is new, people are learning things. We don’t have a whole bunch of history on this like we would have done at Rohm and Haas. Safety, both of the process and our people is key, and that certainly worries me all the time. I think the second one is constantly having the ability to grow our business. I mentioned we’ve done quite well in growing every year so far, that means you constantly have to be looking out at your sales pipeline 12, 18, 24 months ahead so that you know you’ve got a pipeline that will deliver for you moving forward. You can’t look back once – you’ve got to look forward. The third one is having the talent that we need. We are very lean, so every single position has got to contribute. Everybody is wearing at least two hats. We’ve got to be looking at who are the next one or two people we are going to bring on whether it’s in the R&D Group, whether it’s in the Commercial group and thinking ahead and making sure you might make the right decisions there. Those are probably the things that I would spend the most time worrying about. In the last couple of hours of the day with a Scotch before I go to sleep. Jürgen: I guess that helps, helps get the sleep in later on. Jürgen: How many employees do you have at Lehigh? Alan: We’ve got about 77 at the moment. Over 50 of those, between 50 and 60 at any one time are in the production area, and then the rest are salaried if you like, are divided up across the normal range of functions, but we are all in this, aside from the commercial people who work out of their homes wherever they happen to be based, all the rest of us are here on this one site are just outside of Atlanta. Jürgen: You mentioned some things that you worry about, what do you see as the biggest challenge in building an organization like Lehigh, that’s at the leading edge of specialty chemical applications? Alan: That’s a really interesting question, right, from a people point of view, because in the end it’s the people that are going to do this. We are always looking for people that have got this combination of experience in the industries that we are serving. You’ve got to have that otherwise you don’t have the credibility to be able stand in front of them. They’ve got be technically trained and have a technical background, preferably have worked in this type of chemical industry type environment before and yet they’ve got to be willing to leave all that behind and take on a high risk job in a high risk company. It’s an interesting set of mixture of competencies and aptitudes that we are looking for that is not easy to find, and if anything that’s probably been the biggest challenge as we staffed up over the past few years. It’s finding that combination. I think that’s just going to get more difficult as we start to expand now outside of the U.S. into Europe and into Asia because that’s even riskier, because we are only just getting our feet on the ground. Jürgen: It does get you back into what you certainly have a lot of experience with, which is managing remote teams and diverse cultures and locations and all the challenges with legislation that’s different in, in different locations and so on. Alan: Yup, exactly. This year I’ve probably just completed my sixth trip to Europe as we get all that moving and by December I will have been in Asia five times this year. It’s very much like back to the future, it’s like the old days. Jürgen: Where is your office? It’s in an aircraft! Alan: Exactly. You’ve got to do that, right? Half the plan of winning a sale is being there, is showing up. Email and phone calls only take you so far, you’ve got to be there. Jürgen: That leads me on and I was going to ask about the internet …. how you use that. Basically, first of all when did you discover the web? Alan: Myself or for the company? Alan: If you think about this, the first time that we started to use the internet was, was probably in a work environment in the ’90s for Rohm and Haas probably the late ’90s really because we were a bit slow in the up take at Rohm and Haas. It’s probably around the late ’90s and then by the time you and I were working in Coatings, we were just starting to think about online activities. That was in the mid 2000’s, 2005/2006. Well maybe a bit before that, maybe the turn of the 2000’s, right? Around that time. That’s really the first time that I got serious about it. Jürgen: Do you see opportunities there for example for easing that travel load on people to make more use of the web and the technologies because it’s certainly changing at an enormous rate, isn’t it? Alan: Yeah, we do use quite a lot of either Skype, or even Facebook chat or FaceTime. The ability on your mobile now if somebody’s on FaceTime you just click it and you’re looking … you’re standing there on your cell phone talking to them. It’s fantastic as long as the language barrier is not too difficult. Skype we use as well. I’m a bigger fan of both of those than I am of formal video conferencing, because that’s just more complicated to set up and it has to be a more formal meeting type environment. On the communication side I think that’s ideal for us in a small company. On the interacting with our potential customers our website is our main tool and we revamp that basically every two years just to keep it current and to make sure the message that we want to send is the right one and it’s a line with our strategies and I must say that the traffic that we get from the internet, from people finding us is very, very good, if anything is perhaps a bit more than we can handle. Secondary tools for us, we use Facebook a little bit on the social media side, more as just a chatty personal type of interaction with people. We don’t use Twitter. Those are the main things that we do and why we do them. Jürgen: That’s fascinating. Are there any other innovative ways to use the internet that you’re looking at? Alan: There aren’t at the moment but one of the things that’s in our future, we think, is remote control of manufacturing. We do have the ability … in fact we have a camera system in our plant that allows us to record everything that is going on all the time. When you connect that up with a HDMI or with the process control system that we use, you’ve got a very powerful combination of tools. Both of those can be used over the web. Alan: When we open the plant in Spain it will be connected via the internet actually via the cloud to our system here. If we wanted to we can actually control and turn them off and make things happen from here, but it will be more an engineering tool for chemical engineers to share information and accelerate learning if you like, as they get it up and running. Jürgen: That’s so fascinating, I mean there’s a lot of online learning opportunities for the internet and certainly as you mentioned, that use of real data and real case studies to actually generate the information for that learning is really good. All right, now- we’ve talked a lot about Lehigh and about what keeps you up awake at night and challenges and so on. How do you keep balanced? What do you do when you’re not working? Alan: When people ask me what about work-life balance, I ask them what it is! There is a little bit of time, I mean I have plenty of time on an aeroplane, I really enjoy reading both fiction as well as non-fiction. That’s actually one of the things that helps keep me sane, and then I’ve always done photography as well, just like you do, but that’s really restricted to – generally one photo trip a year and then it takes me about the rest of the year to then develop those negatives and print them then get them the way I want them. In the future that will change hopefully the balance will slip the other way once I retire. Jürgen: You used to do a large format camera shots as well. Alan: Yeah, I still do. Yup, 8×10 and 11×14 black and white. Jürgen: Fabulous. Have you read an interesting books recently that you could recommend to our audience? Alan: I think there’s several. For fun this whole Nordic crime genre has become very popular. The Girl with the Dragon Tattoo type stuff, Jo Nesbo is a younger version of the guy that wrote those, and it’s very dark and very Swedish and Finish type thing, that’s kind of fun. I’m also reading a fair amount of history, now of England in the ’50s and ’60s. Around the time that I was born and starting to be cognisant of what was happening around me that’s pretty fascinating as well. Jürgen: That’s good. If you had a magic wand that you could wave and fix one thing in Lehigh what would it be? Alan: I’d lower the cost. Jürgen: Lower the cost of? Alan: I’d take five cents out of our manufacturing cost. Jürgen: That’s a big challenge then is it? Alan: I mean if you think about … again think back to our old days, our goal was to really drive unit cost down every single year, and we’ve been successful at doing that, but as you’re learning the process as it grows and you’re learning how to make more product with the same assets, it’s hard to be have a singular focus on that and make as much progress as you’d like. Alan: I think there’s two major ones. One obviously is Nitrogen and that’s a key input that we use and then the second one is raw material. Whether that material acquire ourselves and shred or whether it’s stuff that we buy, it’s managing that complex mixture of raw materials and making sure that we can get them at a good cost. Jürgen: That’s fascinating I would have thought maybe energy might be a big chunk there. Alan: It is in a way because energy is the major constituent of the cost of liquid Nitrogen right, so in a way that is what we’re buying. Jürgen: You’ve mentioned the expansion plans… and the future plans for Asia as well so they’re obviously the key things that you’re currently working on? Alan: Yes. We are currently selling to Europe. At the moment, we actually bring raw material from Europe to Atlanta, make micronized rubber powder here and ship it back so that we reach compliance and so the quicker we stop doing that and the quicker we make it locally the better off we’ll be. As I said we are selling into Asia now, quite a lot and it’s really setting about what is the timing to start that project because we’ll have volume to put in there straight away as soon as the plant is running and we can handle that in America by export for little while longer in the meantime. Jürgen: Yeah, that’s a great position to be and to have the sales online already before you’ve got the facility. Jürgen: All right. Let’s move on to what I call the Buzz which is our innovation round, so it’s about five or six or seven questions that hopefully we’ll get very short answer from you that will blow the audience away with your insight. What do you think is the number one thing people need to do to be more innovative? Alan: I think it’s to embrace risk. So much innovation is doubtful because people fear making mistakes or their bosses don’t like people making mistakes or the culture is to avoid making mistakes, but you can’t innovate if you don’t make mistakes, if you don’t go down blind alleys, if you don’t try things that don’t work. Embrace risk, make mistakes, enjoy them, learn from them, move on. Jürgen: That’s great advice. What do you see as the risk of innovation the … What you could perhaps guard against when you take that path? Alan: Give it a fair amount of thought first, rule out the really stupid mistakes and concentrate on making mistakes that you can learn from. Jürgen: Try to avoid the mistakes that somebody else has already made as well. Alan: Yeah right, let somebody else do the stupid ones, and you just deal with targeted ones. Jürgen: Yeah, great. What’s the best thing that you’ve done to develop new ideas? Alan: I think listening to as many different people as you can. Whether that’s people that are trying to do what you are doing now, they might have done it before and it didn’t work, people that are in industries that supply you, people that are in the industries that are maybe a replacement product for you, or your customers, your employees, listen. Ask a billion questions, listen and try and join the dots and see what it’s telling you. Jürgen: Do you have a tool or a system for being more innovative? Jürgen: Yeah, so case by case basis. Yeah. All right, what’s the best way to keep a project or client on track? Alan: Oh good Lord! I wish I could come up with a better way of doing that. I mentioned before that half the process of the sale is being there. The more often you’re in front of the customer, the better off both of you will be. The fact that you’re showing up it means that you care. If the visit is planned you’ve got some things you want to cover, it helps keep you on track, it helps keep them on track. I would say if anything in this early stage company, that might well be the simplest and the best tool you can use. Jürgen: That’s great advice and I think that’s a philosophy that you pushed very hard at Rohm and Haas as I remember. What do you think is the number one thing you can do to differentiate yourself? Alan: That’s a great question as well. Talking about for Lehigh in particular I think it’s to, now that we’ve developed our image as a technology leader, as somebody who knows what the product is that they have and knows how to use it, I think protecting that position is probably the single most important thing we can do to create value. There are of course many other things but that’s probably the one that is so different from everybody else that’s either tried to do this before or is trying to do it now, that we need to make sure that we nurture and protect that competency. Jürgen: What do you say is the future for you and for Lehigh? Alan: Lots of people ask me that question, typically in an early stage company they say, “What’s your exit strategy?” Or “What’s your investors exit strategy?” And I tell them … my answer to that is, if we build a great company, we’ll have plenty of exit options. Let’s not even talk about that, let’s talk about how we are going to build a great company. Jürgen: You’ve talked about the plans that you’ve got on the table at the moment, so that’s really exciting. What do you say is the future for the industry, for recycled rubber in general or this kind of thing in recycling other materials perhaps? Alan: Very positive. I would say that we are in the very early stages of the cradle to cradle approach that you mentioned before. It’s very hard to recycle a lot of materials, but it’s gratifying to see that even outside of Lehigh there are lots of people that are trying to figure out how to do that. I see ourselves at the very early adoption phase of that cycle. I probably won’t be around when it’s a major part of the chemical world, but the next generation will. I think we are fifteen, twenty, thirty years away from that situation, where a large part of what we use every day will have been used once before already. Jürgen: That’s great and it’s a good segway into the competition – again as I said I’m giving away a copy of the book Cradle to Cradle by William McDonough and Michael Braungart. Cradle to Cradle talks about continually circulating viable materials so that we are not wasting as much as we do today. What we’d like you to do to enter that competition today is tell us about a recycled innovation that you’re aware of that perhaps you’re doing yourself or you’ve seen other people doing and how that is contributing to this Cradle to Cradle approach. Give us a little bit of a description in the comments below this video and I’ll get Alan to come and have a look at those comments in a few weeks time and award the prize if that’s okay. Jürgen: Great. What kind of things do you expect from the Internet of Things? Alan: That’s another very interesting subject these days. There’s a good friend of mine who’s been a career commercial guy in the startup world, and he’s now involved in that Internet of Things market. You can start to see the first examples of that showing up around this now. Smart houses and some of the stuff that goes into that. The consumers love it because it gives them more control of their environment. I think that’s one of the first places that you’ll start to see simple things happening, whether it’s energy control and savings or whether it’s monitoring other key parts of your household. That’s going to be the first place to hit in my view. Some of the more bigger industrial things will probably follow after that. I think well within my working life, my mobile phone is going to be controlling a large portion of what I do every day. Pretty cool. Jürgen: … log on to that site and checks it out, and looks at the bar charts hour by hour, so yeah it’s quite fascinating. Jürgen: What’s the number one piece of advice you would give any business who wants to be a leader in innovation and in their field? Alan: I think the answer to that one is go for it. Don’t be afraid, don’t be afraid to take a risk. Try it, you can do it. Jürgen: The Nike approach, just go and do it. Alan: Exactly, just do it. Jürgen: Great stuff I love it. Alan, this has been fabulous and I really appreciate your time and all the insights you’ve shared with us today. Where can our audience reach out to you and say thank you. Alan: The easiest place to leave comments is our website www.lehightechnologies.com. We also have a Facebook page for those of you on Facebook, that’s an easy place to leave input. Those are probably the two simplest ones. Jürgen: We’ll have the links to those places below the video when it’s posted. Finally Alan who would you like to see being interviewed on a future InnovaBuzz Podcast and why? Alan: I actually had to do a bit of research on that one, because I wanted to find something that was closer to home for you guys. There’s Professor at the University of Queensland called Professor Maree Smith. She’s obviously got an academic background in the medical arena but she’s had several startups, at least two that I’m aware of that have been successful in the area of therapeutics. One of them … she’s very heavily involved in pain management which is for a lot of chronic conditions in the world now, that’s a very important facet for quality of life and that’s, I think the topic of the latest startup so I think it would be a totally different field than some of the others that you’ve done, and it’s also fairly close to home for you as well. Jürgen: All right, well Maree look out for an invitation from me in your inbox for a future in InnovaBuzz Podcast. Thank you very much, Alan. It’s been fascinating talking to you it was great to catch up again and you’ve been very generous in your time, in sharing your insights with us today on the podcast. I wish you all the best with Lehigh and I look forward to seeing how things develop, particularly over the next year or two with all the exciting expansion plans that you have in place and that are underway. Thanks very much. Alan: That’s great, Jürgen. Thanks very much and I really enjoyed catching up with you as well and hopefully sometime in the next year I’ll be in Australia. We can catch up with a beer! Jürgen: Yeah, we’ll have to do that! Alan: All right. Thanks. Bye-bye now. I hope you enjoyed meeting Alan as much as I enjoyed interviewing him on the podcast. It was great to catch up with him again. Alan is a great leader who builds a culture of innovation and inspires his people to be the best they can be. There are certainly a lot of great tips in the interview. Of course, you can subscribe to this Podcast via iTunes or Stitcher, so that you’ll never miss a future episode. All the show notes for this episode will be at innovabiz.com.au/alanbarton, that is A-L-A-N-B-A-R-T-O-N, all lowercase, all one word, innovabiz.com.au/alanbarton for all of the links and everything we spoke about in this episode. Remember, leave your comments underneath the video for your chance to win a copy of Cradle to Cradle by William McDonough and Michael Braungart. Leave a comment under the video and tell us about a recycled innovation that you’re aware of that perhaps you’re doing yourself or you’ve seen other people doing and how that is contributing to this Cradle to Cradle approach. Give us a little bit of a description in the comments below this video. If you leave a comment under the video, I’ll get Alan to swing by in a few weeks and award that prize. Alan nominated Professor Maree Smith of Queensland University, to be on a future podcast. So, Maree, keep an eye on your Inbox for an invitation from me, for the Innovabuzz Podcast! If you like these podcast episodes, please give us a five star review over at iTunes. It really does help to get more listeners and to share this information with a bigger audience. And I really do want to share these gems, that people so generously share with us on the podcast with as many people as I can. Remember, if you don’t innovate, you stagnate, so think big, be adventurous and innovate on! Was great to catch up with Juergen after quite a few years since my last trip to Oz.